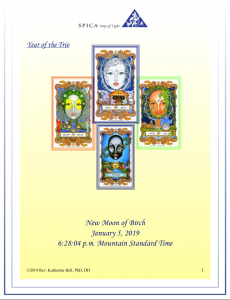 We enter 2019 with an expanded wisdom of what was revealed through our last New Moon Cycle with the Yew Tree vibration. In fact, I find the direction WomanSpirit has encouraged this year to be a step further into the new paradigm we have been talking about since 1994. It is the Paradigm of the Feminine, but more than that, it is the paradigm of the power of our Inner Self. It is also the Paradigm of the Evolution of Oneness and I find Her encouragement of this year’s flow of the lunar cycles to aid us in furthering Oneness and enhancing Inner Power. To take us on a journey of this new year of 2019, and the New Moon of January 5, 2019, let me do some reviewing and honoring of how the Yew wisdom is carrying us through the year of 2019. Also, I would like to initiate what is in store for us as we work with the Divine Feminine guidance of each lunar month. I will begin with the sacred wisdom of numbers before I enter the wisdom of Moon Mother Birch. As I’ve noted in the past, we first look at the wisdom of 20 and 19. The number 20 has many incredible pieces of wisdom to note once again. It corresponds to Plutonia, thus to the inner most activity of our subconscious as well as being a gateway to Universal Unconscious. In astrology, the action of Pluto in our lives often causes enough chaos that our egos have to learn to “growup” and allow our humble realities to bear fruit. In mystical wisdom, the Law of Soul Evolution vibrates within Plutonia/Pluto. I always pause when I think of this on the level of human consciousness. All of our souls are moving through the evolution of journeys through the spirit realm and the realm of matter. I question, where are we in our personal and collective evolution? I love to ponder that as I watch myself go through challenging and rewarding changes and enter a new venue of my life. I am greatly curious as I review the world of our human actions and evolution. We have much to be proud of and much to consider to transmute. Ah, yes, the power of Plutonia is the power to transmute (to change in form, nature, or substance). Are we showing how we have altered as we grow in spiritual practices? Are we showing how we have changed in our humanitarian promises to harmonize, form a union with all others, and heal? Are we transforming our lead into gold, our lessor wisdom into higher wisdom? Are we moving out of the dark ages of our limited beliefs and entering the power of Light and the awareness of our holiness? Pluto reveals the power of directing awareness into our deeper unconscious, using cognitive capabilities to evaluate and clear memories that are directing our life through pathways of negativity and sabotaging actions. Pluto reveals the healing path that aids us in taking command of our false beliefs, fears and phobias, and enter the light of our higher nature. When we do this, we allow a more positive evolution of our soul to occur. Pluto, thus, can be seen as a door way into darkness with passageways to guide us to light. That leads us to the number 19. It relates to Suil (Sun), a brilliant light. The Law of Regeneration vibrates within this quality. The Sun is also seen as the correspondence of our Higher Self; our MasterSelf. 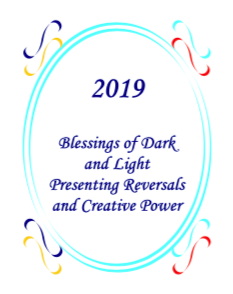 As we look at the dark of Plutonia and the Law of Soul Evolution, and the light of the Sun, we can recognize that this is a year to regenerate the Light of our Soul Self and open the passage way for a stronger, brighter evolution of our soul intentions. This is both personally and collectively occurring. One more note of the 20 (Pluto/Plutonia) and the 19 (Sun /Suil) is the blessing of Water and Fire. This is an indication of an alchemical year! What are we mixing in the cauldron of this great change? Will the Alchemy truly bring a higher order to our psyche and thus our world? Will we present the transmutation of self, letting go of the lead that binds us to the old, or will we truly align in Light and transmute to the Gold of higher consciousness? Next step in the realm of numbers is adding 2+0+1+9 and realizing that is 12; then taking 1+2 equaling 3. Ah, both the 12 and the 3 become the significant foundations of energy for 2019. The Twelve is the focal point for continuing the power of the Yew. It is the dual laws of: Law of Reversal and the Law of Reflection. 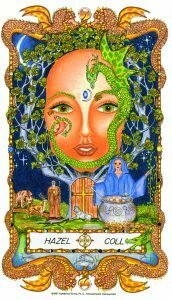 The Law of Reversal places us in the energy of the wisdom of the Yew Tree, to turn upside down, empty out, and enter the realm of our deeper psyche where light can be found and a reflection of the Holy One is seen. The initial reflection is our higher nature, our Messiah Self. The ultimate reflection is the vision of our Divine Self. We enter the realm where we have the ability to recognize that our individual self is the reflection of the Holy Spirit. As we look into the mirror of the Divine, we see the Divine. As the Divine looks into the Mirror, S/he sees itself as us. The power of looking into the mirror and seeing our Divine essence presents us with the transmutation that guides us to the transfiguration (the radiant glory of our spiritual state of being). Throughout the year, we will be in the reflective powers of the number 12. We will be Re- Membering what we have set int a station of consciousness we must learn to access. What is to occur with the number 3? In the story of Odin, turned upside down on the Yew Tree, there are two things to consider. One, he pierced his self so he could be in the world of matter and the world of Spirit. He remained there for 9 days and 9 nights. The number 9, of course, is 3×3. Thus, as he gathered the wisdom of the Universal Tree, he returned to the realm of physical reality whole (Law of Wholeness corresponds to the number 9) and began creating a world of wisdom to be shared with others (the #3). What faculty of consciousness was he using? He was using his creative faculties along with the power of awareness he gleaned when he emptied out and formed a union with the Oneness of All Wisdom. The number three relates to dual laws as well: The Law of Creative Imagination and the Law of Attraction. When we empty ourselves out, reflect on the true power of Divine Consciousness within us, we are connected to the Tree of Life and thus all wisdom. In this state of consciousness, we use another power of the Holy One, the power to vision what is to transform, transmute, and transfigure from the state of Spirit to the state of Matter. We use much more of the perfect power of imagination, known also as visualization, and create the field of synthesizing energy of spirit with the energy of matter. We then activate the magnetic fields of both and bring into the realm of our earthly existence the desired vision into our material realm for use in our daily reality. The question we might ask is, “How do we use the Greater Wisdom so what we create and manifest that truly is the reflection of the Holy One and increase the power of the Evolution of of our soul as well as the Evolution of Oneness? How do we express the power of Living the Light of True Harmony and Sacred Creative Manifestations? I believe that is the blessing of the teaching of the Holy One (WomanSpirit) throughout this year. If we diligently follow the path of instruction we will enhance our nature of being that synthesizes our five senses, with our sixth sense, and ultimately with our Divine Sense of Being. Our five senses reveal that we recognize ourselves when we look into a mirror, we hear ourselves when we speak, we can touch our body and other things and know we are a living creature of the earth, we can smell the aroma of our self and all of our earthly experiences, we can taste life in many ways, and we can think and contemplate which also allows us to know that we are existing. As practitioners of meditation, contemplation, and realizations of realms beyond earth, we enhance our intuition. By allowing ourselves to blend into the Universal consciousness and experience the “more” of existence we enhance the ability to know we are Spirit in Matter, we are the Divine in its essence of Multiplicity. We are the Micro and the Macro of existence. May we enhance this wisdom. Using our five senses throughout the year, we are to empty out, reverse our trends, and await the inspiration of creative ventures. To aid the process we are asked to take each Lunar Month and seek to enhance our three levels of consciousness: Cognitive, Unconscious, and Supernal Consciousness. We will be directed to understand the foundations of each state of consciousness throughout a lunar cycle. One Activator will guide our actions. We can furthering the power to unify in the evolution of oneness through an act of patience as we enter Birch. This is the time to strengthen our loins to birth the baby of Oneness as that has been in the aura of the Earth, not the embodiment of physical reality. We will reverse our belief of separation and re-member our union with Source. We use the great triad of the Holy Spirit recognized on the Tree of Life as Kether, Chokmah, and Binah: The Power of Oneness activating Creative Chaos, and Expressing through the Womb of Shekinah (Divine Feminine). These three states will be known in the higher vibrations of each triad of foundational states of consciousness. As we begin the lunar cycle of Birch on January 5, 2019, the three foundations are Birch, Willow, and Hazel. The single activator is Saturnea. Birch sets the foundation of our cognitive awareness. Though we may be snow- blind, we are nonetheless called to use our Beta level to maintain the clarity that what we do not see we know is nonetheless there. In fact, with the Universal Law of Living, reflected through Birch, is the cognitive state we want to use: The knowing we are living on all dimensions at all times. We are called to realize that our wishes and dreams are preparing to enter the realm of matter, even though there is an experience of the state of an unseeable existence. During the time of Birch we are to know that our dreams and desires are incubating and we must take care to hold our mind and emotions clear with the knowing the birth will be perfect and in right timing even though we see nothing through our human eyes. Also of importance is to hold our “Intention to Achieve” the desired goals we set out in the stream of Universal Consciousness, our personal Unconscious, and our Cognitive state by visualizing our desires. 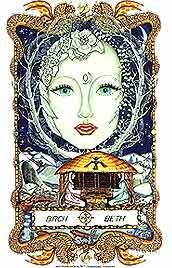 Birch is a very important state for this month as she directs us to remain clearly aware and consistently clarifying our union with Source and adhere to a visual and emotional focus of our desired outcomes of the month and the year. Birch will be reflecting to us any levels of doubt we might have so we may empty those thoughts and feelings and open to the creative power of melting the snow and living the creative expressions our intentions throughout 2019. The Bee on the hut of Birch not only represents the Goddess, but the power of Sound. It calls everyone to be aware of our words and the feelings connected to the words used…for they hold great power to manifest. As each one of us chooses a focus and intent to visualize our desires, it is important to bring sound to it. I encourage you to create an Affirmation that confirms your dreams and desires as already being. This power of our Cognitive Consciousness calls us to form a sacred boundary, maintaining our thinking in the knowing state that We are the Divine in Living Matter. We are the ultimate Reflection of The Holy One, revealing Its pure nature as a human being. The Universal Law associated with Saturnea is: The Law of Universality….noting everything is the One Essence. That focus connects very well with the Law of Living. Throughout this lunar month we are called to consciously know that We Are the Essence of the Divine and we are the Living Divine carrying the ability to connect with, utilize, and achieve the weaving of Spirit into the realm of Matter with knowledge of how to use the dimensions. This weaving causes the effect of manifesting desires. 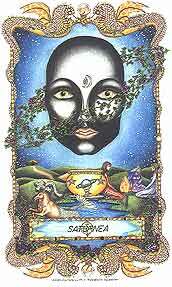 Saturnea’s gift is to recognize we are the natural soul of the Divine carrying creative abilities. To use these abilities, we are requested to get beyond the nature of deceiving ourselves that we are not of the ilk of the Holy One. We are called to assess our True Self and raise our consciousness to that level. In so doing, we bring the Will of the Divine into the Essence of all we desire. We thus, put our mark into the world of manifestation and rejoice in the Oneness we display in all areas of our life. Willow – The Foundation of our Unconscious throughout the Birch lunar cycle! When using the term “our unconscious,” I desire to clarify two different states of our inner awareness. The subconscious of our self is our storage of this life and experiences we have that reflect back out into our active world. The memories of joy and the memories of being less than occur in this pocket of our inner self. It is the field we enter into to clear the saboteur and open the door to our Unconscious state that is the field of our Soul, Soul Purpose, and Soul Memory as a Divine being; ultimately the memory of our Higher Self. As we move through the evolution of this year, it is the focus of our Soul Wisdom that we want to bring to our attention. In the cycle of Birch, Willow is a revealer of our Unconscious self and our Nature of Being. Willow provides us the inner knowing that we are Masters/Avatars/Messiahs. Willow corresponds with the Law of Life Mastery. During this cycle of Birch, the energy of the wisdom for Mastering our life is most assuredly present in our unconscious level. As we set the foundation for our dreams and desires to be fulfilled throughout 2019, Willow will be the constant reminder from our inner being to take command, listen to our soul desire, and activate it with the sounds we noted with the symbol of the Bee. Willow calls us to empty out any part of our subconscious that holds to anything less than our Master Self. She will ask us to bring forth the Mirror of the Goddess and recognize Her face as our Face. She will call upon us to feel the beauty, the worthiness, and the ability to reflect this power in our personal life. Willow will be aiding our ability to know what is beneath the snow of Birch. She will be reflecting the talents we have, the intended manifestations we will bring into our daily living, and the creative power we have to use. Connected to our unconscious, we will know the power to cultivate our desires without hesitation. Surely, Saturnea’s active frequency will aid this process. The field of Saturnea carries the vibrations of determination, dedication, discipline and devotion (4-D’s). Thus, her support through the unconscious strengthens the power of Self Mastery. With Saturnea’s Law of Universality, our Mastery can easily be cultivated. We have the knowing our soul is calling us to manifest throughout the year. We will easily use the 4-D’s within our subconscious and unconscious joined as one. This will impulse our cognitive awareness that we are centered, grounded, and ready to unfold each step as the snow melting reveals to us. Hazel – The Foundation of our Supernal Consciousness throughout the Birch lunar cycle! Our Supernal Consciousness is our Divine State. As we form a union with this state of consciousness, we know We Are The Divine! In the power of the Hazel Supernal Consciousness throughout the lunar cycle of Birch, we live in the ultimate power of Faith. No Doubt, No Fear, and No Sabotaging attitudes occur. The blessing of ultimately knowing what is beneath the snow of Birch is accessed. The Universal Law within Hazel is the Law of Wholeness. Once again, we see the power of Everything is the essence of Oneness. Everything is Source, God, Goddess, the Holy Spirit, the Holy One (just a few names honoring the point of consciousness we speak of as the Most Holy Creator of all). This law reveals to us that our very being is whole. We simply need to grasp this state of our being during this first cycle of 2019 and hold on to the wisdom. In so doing, we most certainly will manifest, in our earthly reality, the desires we are called to fulfill. For in truth, our desires are a call of the Supernal Consciousness to bring manifestations into the Earth, an impulse of our Unconscious reminding us of our part to be played from our soul level, and our conscious quality must unify with all in order to allow the manifestations to come to fruition. Yes, we must discipline ourselves to consciously hold to the true nature of our being, release the false beliefs and fears, empty out our old memories, and connect to the supernal quality of our being. We are called to recognize what is going on at all three levels of consciousness so we may enter the field of the Evolution of Oneness with the purest of faith, the power of mastery, and the willingness to bring our mark into a world of touch, taste, smell, hear, and see. Let us touch the purity of our nature, taste its ambrosial quality, smell its perfume of excellence, hear its voice, and see its true essence: The Divine. By now it is easy to see the value of Saturnea in all states of consciousness. The Law of Universality plays a major part with the Law of Wholeness that Hazel presents. We are given the blessings of realizing our Human Temple is a perfect reflection of Source. Saturnea represents the Signature of the Universe marking Its place in the land of matter. Thus, in the realm of our Supernal Consciousness, we can recognize the Divine Signature as our Signature. As we recognize our Master Self in our unconscious, we activate the Ultimate Signature of our Being. As our Cognitive state holds to the value of awareness, we will place our mark in this new year and activate the contract we have agreed to fulfill throughout 2019 with our soul self and ultimately, our Divine Self. We will live by pure faith and release the higher knowledge within us. Ultimately the New Moon of Birch is a great time to initiate our New Year Desires. Using the three states of consciousness, we will enhance the ultimate wisdom of knowing the power of the Divine within us. The Divine Principle becomes the guide for all outcomes and our human will rises to the blessings and power of our Divine Will. I do know this is a time when many people desire to set their dream board for the year. Begin it, if you wish. Be sure you are actively listening to the Supernal Consciousness, Unconscious impulses and your cognitive knowing of what you desire before you begin. Unify your three states of consciousness through meditation, contemplation, and knowing; then set your dream board with visions of your desires. The power of the next lunar cycle will call you to solidify your intentions and begin to take action. I truly ask of you to review broader fields of awareness by reading the book that corresponds with the cards of the Faces of WomanSpirit. 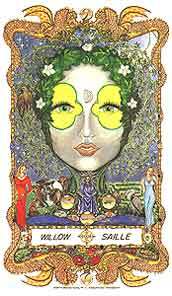 That book, of course, is THE FACES OF WOMANSPIRIT, A Celtic Oracle of Avalon. Happy New Year and may many blessing grace your life in 2019 as you allow your soul to evolve to the light of your true self. May your continued emptying out allow your natural vessel of Spirit create in new ways in your life.